The code of this version of Dolly breakout has been modified from joy22 to be used in the latest version of MetaTrader 4. Dolly Breakout is an intraday trading system. Time Frame 15 min, 30 min, 60min. Currency pairs: AUD/USD, EUR/USD, GBP/USD, USD/CHF, GBP/JPY, EUR/JPY, AUD/JPY, NZ/USD. To buy and sell follow the instructions on the display. Buy area with two buy levels. Sell area with two sell levels. We have also the upper and lower correction area for entry in direction of the trend on the retracement. Example, if the trend is up, we entry buy on the lower correction area, if the trend is down we entry sell on the upper correction area. 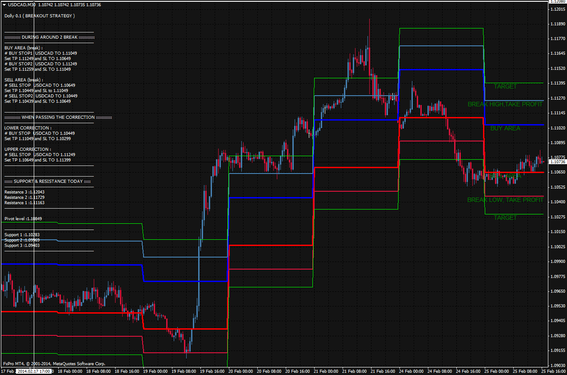 On the video there are indicates the levels of the support/resistance and the pivot levels.